Now that you’ve experienced the fun, ease, and excitement of having your very own WordPress.com blog, why not tell your friends so that they can tell their friends, and their friends can tell their friends, and so on? Click the Invite New link in the Users submenu to load the Invite New Users to Your Blog page. This page gives you the tools you need to add new users to your blog. By user, WordPress means simply a person who is a member of your blog as a contributor, an author, an editor, or an administrator. You can have an unlimited amount of users on one WordPress blog. Enter up to 10 e-mail addresses for people you’d like to invite to your blog, assign a user role, add an optional message to them, and click the Send Invitation button. 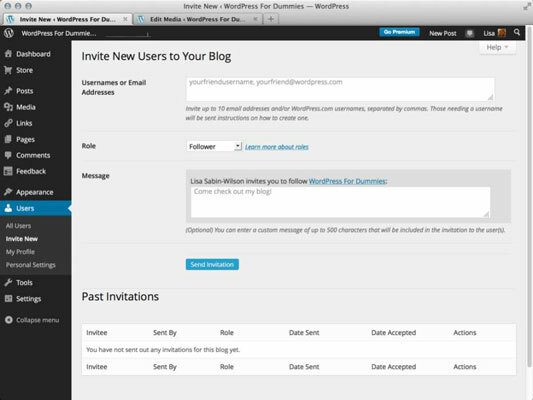 If the person you invite already has a WordPress.com account, your blog is added to his Dashboard after he accepts your invitation. If you enter someone who doesn’t have a WordPress.com account yet, WordPress sends that person an invitation to become a member, along with instructions on how to sign up. At the bottom of the Invite New Users to Your Blog page, in the Past Invitations section, you can review users you’ve previously invited to your blog and their current status (whether or not they’ve accepted your invite and the date they accepted it). Click the Invite New link in the Users menu. The Invite New Users to Your Blog page opens. In the Usernames or Email Addresses text box, enter either a user’s WordPress.com username (if that user already has an account) or the prospective member’s e-mail address. Select the appropriate role in the Role drop-down menu. Type a special note to the user in the Message text box. This message appears in the e-mail that the user receives. Click the Send Invitation button to send the invitation to the prospective member via e-mail. When you complete these steps, WordPress sends you confirmation that the invitation was sent.